A little over 300 miles and a week since my update and no issues. Not to jinx myself but had ECU update done 12/31 and 600 miles ago and so far no problems. Over a week for me and no problems. I was told that now my engine has a lifetime warranty. My brother insist that there is no way the Turbo Charger, etc. is included. I would interpret the statement from Kia to mean that if the vehicle goes into limp mode from a bearing knock being detected, AND you have been keeping up on the maintenance, AND you didn't drive a long distance in limp mode , getting it into a kia dealer promptly, they would cover the engine long block. At least, that's how I would see it as a customer reading their statement. The turbocharger is not considered a normal part of the long block, however Kia might just foot the bill for the entire repair if things looked good otherwise and you have been taking good care of the vehicle. If there is nothing wrong with the old turbo it can be used again without issues, but if metal debris has damaged it in a visible way they may have to replace it as well. These things always come down to a case by case basis, how extensive a repair will need to be, to restore the vehicle to reliable service. Each repair will be slightly different based on what damage took place during the failure. Any reason not to have this done? The Service Advisors at my dealership seen to be very well informed about this update and the consequences. When I had mine performed yesterday I was told I might want to hold off while Kia resolves some remaining technical issues. For 2016+ Sportages (and other models), Kia doesn't yet have a procedure in place to handle the P1326 DTC. For earlier models they perform a wiring signal interference check and, based on those results, either repair the wiring harness or replace the engine long block. Apparently that interference check doesn't work with 2016+ models, and Kia has yet to provide dealerships with a revised procedure. My dealership has two tech cases in work for later model cars awaiting the revised procedure. The owners were provided loaners until Kia resolves the problem. Wow, thanks. A US dealership I take it. Had mine done yesterday. took about 40 min. I find no difference in driving dynamics. The S has HTF. Look at the news about the new recall. This one is about engine fires from a mis-handled fuel line on cars already repaired because of engine failure. This looks to me like they are having some issues with the dealer techs and processes followed during the repair procedures on the engine recalls. I wouldn't put too much emphasis on it, although the optics are not good for Hyundai / Kia. They will have to error on the side of caution, but who knows how many will even have an issue before another recall procedure is performed. Whenever a company issues a recall, then has to recall that due to bad processes during the repair, that's never going to look good no matter how you spin it. That said, it could happen to any car company. OK, so I did a little more digging on this latest recall regarding previously recalled vehicles. Turns out, during the engine replacement process, obviously the high pressure fuel pump needs to be removed. What may be happening is for some reason the technician may not always have used new fasteners on the high pressure fuel line during assembly. 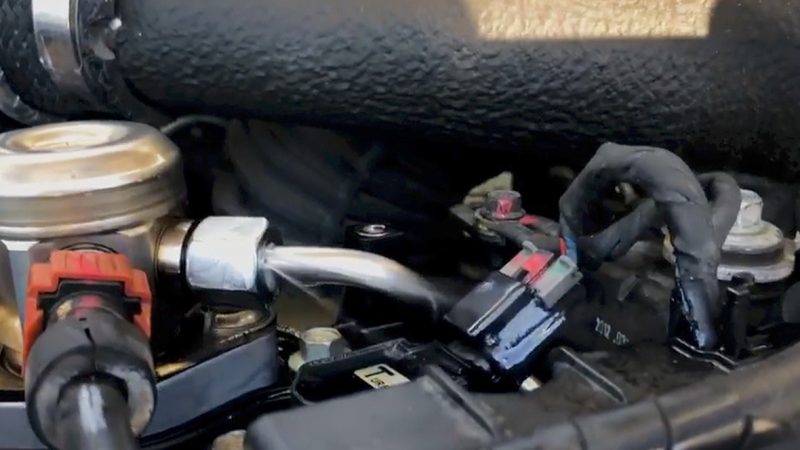 This can lead to sudden high pressure fuel leaks, which can lead to a very fast engine fire. Another salient point in this is the number - did anyone else see it? It was about 170,000 vehicles, all told. That says to me they have already replaced engines on 170,000 vehicles! That's a lot more than I thought and there are X numbers of them driving around that have not blown up. I hate to say it but this bumps the odds up for any of them developing a rod knock - which of course is the reason for the recall/software update. I know my dealership has had a car in the shop undergoing an obvious engine replacement every time I've been in there since March, 2011. The NHTSB is on H/K very hard about this but because of the government shutdown they haven't weighed in on this development but generally they are not satisfied with H/K's response to the overall engine problem. I think bottom line, H/K is going to buy a lot of cars.